The banking system is a parasite on the real economy. Economics is easy to understand. Wealth comes from human beings. It’s as simple as that. It comes from human beings engaging with nature in an intelligent and productive way in order to make all of the things we want and need. It is work that makes wealth. This is so obvious an observation that it hardly needs commenting upon. All of the classical economists understood it: Adam Smith and John Stuart Mill, as well as Karl Marx. 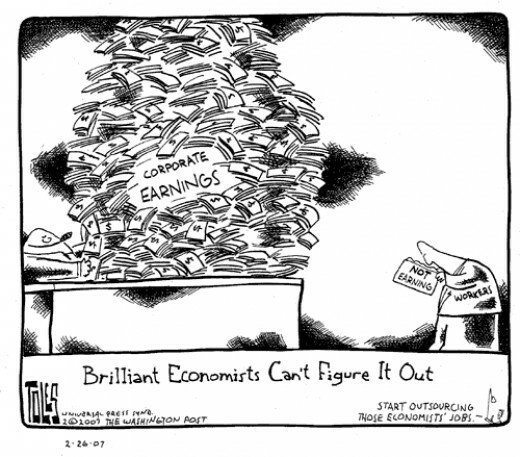 The reason that modern economics has become so complex is that it has attempted to obscure this simple fact behind a fog of distraction in order to hide the processes by which a very few people have become more and more obscenely wealthy, while the rest of us are being squeezed to the point of desperation. We’ve been living under an illusion for the last 30 years or so. The illusion goes under the collective name of “Monetarism”. It is also sometimes known as “Thatcherism” or “Neoliberalism”. In the US it went under the name “Reaganomics”.